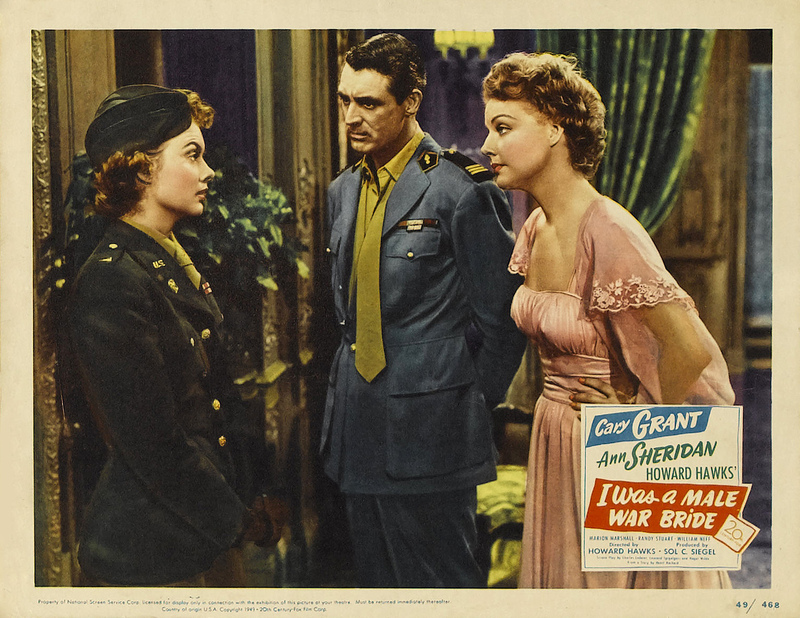 I Was a Male War Bride (1949), starring Ann Sheridan and Cary Grant, is one of the 1001 classic movies you should see. Each Monday, I'm going to recommend a classic movie you should see (for the reasons behind the 1001 series and reviews of earlier films covered go here). June is the traditional month for weddings so throughout the month I'll write about four diverse movies with "bride" in the title. This week's selection is the Cary Grant comedy, I Was a Male War Bride (1949). 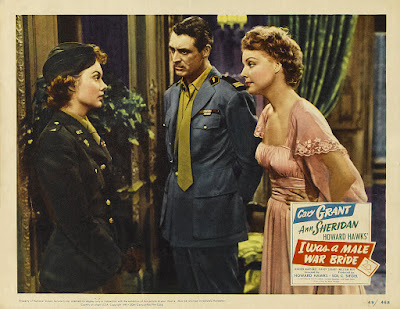 I Was a Male War Bride tells the story of Henri Rochard (Grant), a French army officer who is assigned to find a black market smuggler (Martin Miller) in postwar Germany with a member of the Women's Army Corps, Catherine Gates (Ann Sheridan). After a series of misadventures involving a motorcycle sidecar, Henri and Catherine fall in love and decide to get married. Catherine is unexpectedly ordered to leave for the US on the couple's wedding night, which sets in motion a complicated diplomatic process that drives Henri and Catherine to desperate measures. I Was a Male War Bride was based on a story by Belgian army officer Henri Rochard about the diplomatic difficulties he and his American wife faced. Although Rochard's story was a serious treatise on the difficulties of legal immigration, director Howard Hawks saw the opportunity for a screwball comedy that would showcase the razor sharp comic timing of Grant. 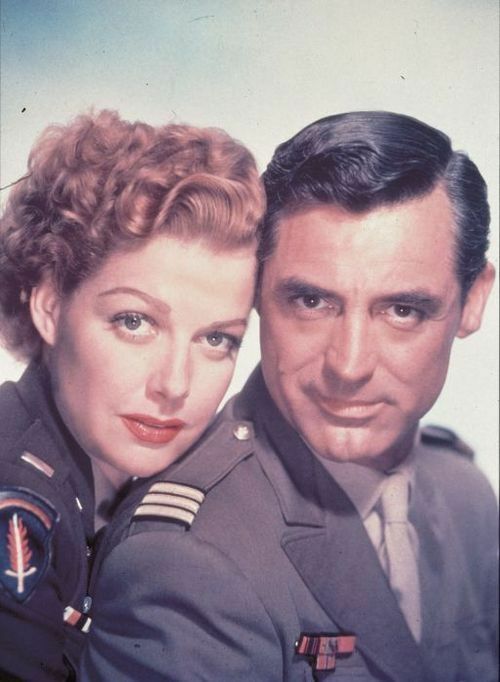 The filming in Germany and London was fraught with difficulties -- Grant got infectious hepatitis, Sheridan came down with pleurisy that developed into pneumonia, and Hawks broke out in hives -- but I Was a Male War Bride was a huge hit, becoming the third highest-grossing movie of Hawks' career (No. 1 is Sergeant York and No. 2 is Red River). Although I Was a Male War Bride is aimed mostly for laughs, it does give a fairly accurate picture of the cumbersome and sometimes ridiculous bureaucratic red tape of legal immigration. Rochard is allowed to go to the US with his wife because of an obscure law and he soon learns to recite his legal status by heart; one of the movies funniest running jokes is Grant continuously repeating, "I am an alien spouse of female military personnel en route to the United States under public law 271 of the Congress." 1. Screwball comedy. By 1949, the glory days of screwball comedy were long over, but Hawks revives much of the zany spirit of the genre in I Was a Male War Bride, especially in the verbal sparring between Henri and Catherine and the duo's many motorcycle misadventures. 2. Cross-dressing. Grant in drag is the one thing people know about this movie, but it actually only takes up about 10 minutes of screen time. 3. Stunts. Despite his illness, Grant insisted on doing his own stunts for this film, and Hawks certainly gave the former acrobat a workout. Not only does he hang off window ledges and get repeatedly run through hay stacks, but, at one point, he precariously dangles on a railroad crossing sign. 4. Postwar Europe. Old Hollywood produced hundreds of World War II movies, but there are relatively few movies about postwar Europe. I Was a Male War Bride gives viewers a glimpse into life in postwar Germany, from the complicated regulations that control where military personnel can sleep to the difficulties in finding a real cup of coffee. Other critics: I Was a Male War Bride has a 79 percent fresh rating at Rotten Tomatoes, and Leonard Maltin calls it a "delightful comedy of errors . . . Grant in drag makes this one worth watching" in a three star review for his Classic Movie Guide. Critics in 1949 weren't so kind. The New York Times critic Bosley Crowther panned the movie. He complained about the haphazard nature of the plot, writing that "the flimsiness of the film's foundations and the disorder of its episodes provoke the inevitable impression that it all fell together en route." The Variety critic was even harsher. "[The] Picture’s chief failing, if it can be called that in view of the frothy components, is that the entire production crew, from scripters to director Howard Hawks and the cast, were apparently so intent on getting the maximum in yocks that they overlooked the necessary characterizations." 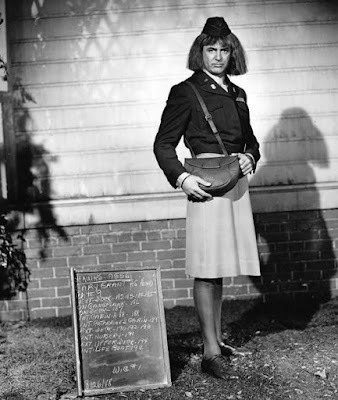 Cary Grant in a wardrobe test for I Was a Male War Bride (1949). The bottom line: I Was a Male War Bride doesn't reach the screwball heights of Bringing Up Baby or His Girl Friday, but it's still a laugh-out-loud comedy with one of Grant's best comic performances and great chemistry between the two leads. Availability: I Was a Male War Bride is available on DVD and video on demand. I'll be off next Monday for Independence Day, but I'll begin the theme of Olivia de Havilland movies on July 11 with The Adventures of Robin Hood (1938). A laugh-out-loud treat. Hey, if you don't laugh at bureacracy, you'll cry! I wish Cary and Ann Sheridan had appeared in more films together. They made such a delightful team. Me too! She was a great sparring partner for him like Katharine Hepburn and Rosalind Russell.